Dating is often fraught with uncertainty and can turn the most out-going men into shy creatures. This means that along with understanding your own feelings, you also have the perilous job of determining whether or not you've captured his attention. Don’t worry; it’s certainly possible! Read on for our tips on how to tell if he's into you - or not. We’ve all been there before – checking our cell phone every 3 minutes, hoping for an invitation to a special event, or even just a simple “hello”. Many times, knowing if someone likes you or not is a gut feeling that resonates loud and clear. However, sometimes that feeling might be muffled due to stress, change or the opinions of others. So take a second and read through these list of “I like you” signs. Unless it was love at first sight, there’s a good chance that his behavior changed between first getting to know you and developing a crush on you. Does he go out of his way to be kind to you? How does he treat you in comparison to his other female friends and acquaintances? Does he open your door or take your coat? As old-fashioned as these traditions may seem, they’re still modern indicators that he cares about your comfort (and you). On a side note, I’m a big fan of chivalry, it’s romantic, classy and it sets a guy apart from the rest. When anyone starts hanging out with someone whose personality meshes well with theirs, both parties are likely to pick up traits of the other person. Consider any new interests or hobbies he’s developed recently. Were any of them originally your suggestion? When you’re trying to answer the burning question of how to tell if he’s into you or not, stop and ask yourself if he’s started using the same phrases or expressions as you. This is a sign he’s seen something in your personality that he’s very attracted to. Emoticons, also known as smiley faces, are indicators that he enjoys having playful conversations with you. Texts that include 🙂 and especially 😉 are a very good sign that a man is interested in you. Scroll through his texts. How many of the conversations did he start? 50%? then breathe a sigh of relief because you’ve clearly been on his mind. On the other hand, if you’re the one who instigates most of the exchanges, than you might be more attracted to him then he is to you. So, if you’re on the fence about what to believe, take it easy. Go a couple of days without texting him, and see what happens next. If starts texting you for silly reasons, then he probably misses receiving your texts (and you) and it’s a pretty good indicator for how to know if he’s into you. 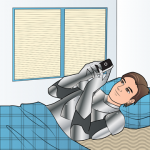 What is He Texting You?  The contents of his texts are just as important as how often he launches a conversation. Keep an eye out for texts that are chatty and ask questions about how your day is going. Good morning and goodnight texts are also good for how to tell if he’s into you or not. Being included or mentioned in various areas of his life is a clear (and positive) sign you’re on his mind. Notice how his female friends in particular act around you. For example, if they start chatting about the cute guy across the room, and they don’t include you in the conversation, then they probably assume you’re there for their friend. Does he bring up mutual interests? Perhaps both of you love the same television show, or take on the same hiking trail every weekend. Think of these conversations as hints that he’d like to do some of them with you. A man who is interested in you should only have the nicest things to say about you. If he doesn’t speak up on your behalf, then he is not worth pursuing. For example, are you proud of your new painting? If so, listen to hear whether or not he compliments your creativity. Are you sad that you didn’t get the raise you were sure you were a shoe-in for? Pay attention to the words of support he gives you. These are likely the same things he says to others, even when you’re not around. There you have it- how to tell if he’s into you – or not. Guess what? Even if he isn’t, there are plenty of guys out there who are. Dating, like most things in life, is a numbers game. So, put on your pretty red dress, grab your cell phone, and go get your text flirt on! The worst thing you can do is spend your evening alone asking yourself (or your friends) over and over how to tell if he’s into you. Instead, sign up for our Free 30 day texting Club trial.